There are wine and food festivals, and then there’s the Newport Mansions Wine & Food Festival. 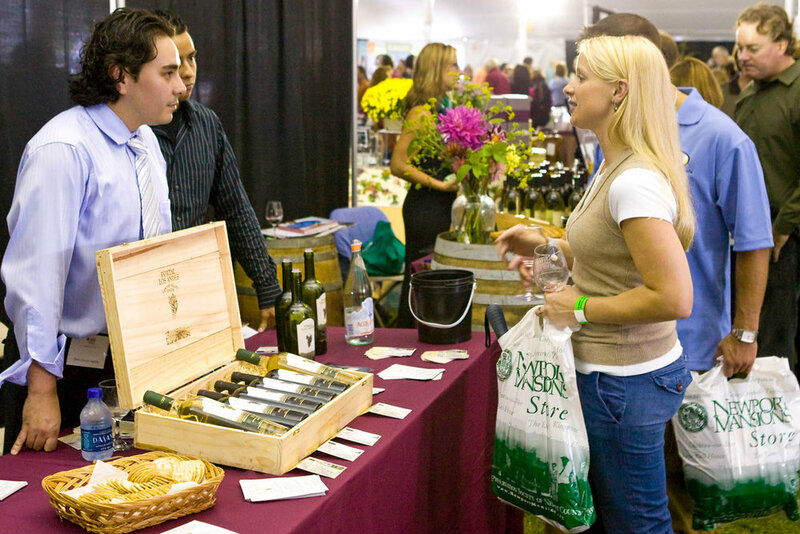 Dubbed “the best wine festival in the country” by The Wine Observer and Boston Foodie’s “favorite food and wine celebration of the year,” this annual event is a must do for wine lovers and lovers of a good time alike. Wondering what you’ll find at 2018’s Wine & Food Festival this September 20th-23rd? Here’s a closer look. Wondering where the best event in Newport to see and be seen this season is? While Newport’s social scene is packed with grand gatherings and sophisticated soirees, this is the ultimate get-together. At the heart of the event? Two days of grand tastings under the big tents at Marble House featuring hundreds of exquisite wines from around the world; extraordinary food from local, regional and national chefs, celebrity chef experiences; and cooking demonstrations. Festival highlights include wine seminars with leading food and wine experts; gala dinners in spectacular seaside settings, like the Wine & Rosecliff Gala, The Bordeaux Dinner at The Elms, the around-the-world Vintner Dinner at Rosecliff, Sunday Jazz Brunch on the Marble House Terrace, an Opus One tasting and the Newport After Dark Party. Free parking and shuttle transportation sweeten this decadent deal. This year's special guest speaker is Zac Posen. Head to Marble House on Saturday, September 22nd for a lively and engaging conversation with internationally acclaimed fashion designer and cookbook author Zac Posen. Zac will be signing copies of his new cookbook. Then enjoy early admission to the Grand Tasting festivities under the tent for the rest of the afternoon. Joining Zac on the Monogram Culinary Stage are Annie Copps of Yankee Magazine, Lydia Shire of Scampo, Maura Kilpatrick of Sofra Bakery & Cafe Cambridge and Kolin Vazzoler of Simi WInery. The Wine & Rosecliff Gala kicks off the nighttime festivities on Friday, September 21st at 7:00 pm. Prepare for an evening of high style paired with fine wines in the stunning setting of the Rosecliff ballroom and terrace. You will feel transported to a bygone era where grandiose parties were planned for dining & dancing each summer. Enjoy delectable cuisine prepared by fifteen renowned local chefs and even a few visiting Chefs from New England and the Caribbean. This is a culinary journey to remember. Wine & Food Festival revelers looking to keep the party going, meanwhile, will find Newport After Dark delivers -- and then some. Mixing, mingling and more await at Forty 1º North on Saturday, September 22nd, where party-goers will enjoy special wines, specialty cocktails and gourmet late-night bites. And did we happen to mention dancing under the stars with the city’s glistening waterfront as the backdrop? And, sure, you could stay home and sip for no reason (no judgment here), but when you attend the Newport Mansions Wine & Food Festival, you’re sipping for a cause: All proceeds support the historic preservation mission of The Preservation Society of Newport County. The Preservation Society of Newport County, Rhode Island's largest cultural organization, protects, preserves and presents the best of Newport County's architectural heritage. Its 11 historic properties and landscapes - seven of which are National Historic Landmarks - trace America's architectural and social development from the Colonial era through the Gilded Age. Ready to embrace your inner oenophile? Book your stay with us at The Chanler today as limited availability remains. You'll have the opportunity to meet our very own Executive Chef Matt Voskuil who will represent Cara and The Chanler at this year's festival.